Started approximately 1969 by Bruce Bakalian, founder of Icthus Associates, in an attempt to reach unchurched youth. 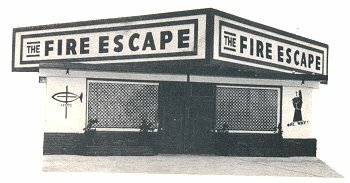 The Fire Escape, Stanton CA was run by Bill Barry before and after Bruce Bakalian was killed in a car accident Sept 22, 1976. Bill is currently an Associate Pastor at CC Arroyo Grande O. (805) 481-2320 or (805) 489-6013. Bill also took over as the Director of the Ichthus corporation which is still in operation. A small building next to a radiator shop was transformed into a gathering place. Together with a young man, Gary Jones, they set a format geared to the interest and needs of the youth in the area. Friday, Saturday, and Sunday evenings, coffee was brewed, cookies set out on the resined old cable spool tables and black lights turned on while house lights dimmed. Day glow gospel posters lined the walls. The volunteer staff would gather for prayer, and the doors would open to greet local high school kids, hitch hikers on their way to the beach, and passers by. Being a couple of miles south from Knott's Berry Farm, on the main drag toward Huntington Beach, it would attract a wide range of people. In 1971, Phil Mahlow became the manager of the Fire Escape. He booked the Maranatha bands of Love Song, The Way, Children of the Day, Blessed Hope, etc. as well as Agape, Rebirth, New Wine and local musicians. No fees were charged, although a large coffee can on the counter was marked "Donations". At the end of the music and testimonies, he would present the Gospel and invite people to give their lives to Jesus. It was a fruitful time of harvest, and many responded. The Fire Escape remained open until 1974, being one of the longer functioning Christian Coffee Houses. 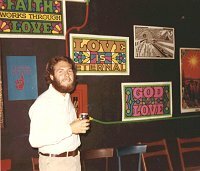 Icthus Associates also founded The Ark, another Christian Coffee House called The Rock in Bakersfield in 1973-74. It closed in 1980 and then burnt down shortly after closing. The Ark was located in Porterville, CA in a former Masonic Lodge on Main St and Putnam in the Winter of 1971. Gary Jones moved from Southern Calif to open the Ark. Bruce Bakalian, Eddie Taylor, and John Benas joined Gary and worked with him to open the Ark. Bruce managed and booked groups such as the Children of the Day, Mustard Seed Faith, Ralph & Debbie Brier, and many more. Gary Jones has since earned his PhD at Southern Calif College, Eddie Taylor is involved in Radio Broadcasting, and John Benas chose a career in Law Enforcement. The Ark closed for a short time before Bruce was killed in 1976 and was then reopened by Ken Armstrong in 1977 in a grocery store storage room on Villa Ave.. It remained open for about 1 1/2 years, booking the Rez band, Aslan, Darby Slick, and many other contemporary Christian groups. A contemporary Christian Radio program (1st in the Southern Valley) known as the Ark was started at KDNO in Delano and then moved to KIOO in Porterville. The show was 7 days a week from 10 PM until 7 AM. Saturdays we broadcast live from the Ark starting at 8 PM. We also had several groups one of them, "One Way", cut an album.